We absolutely love seeing IntenseDebate pop-up in new and interesting locations, so we we’re thrilled that Neil Boyd put together an excellent guide for integrating IntenseDebate with Sandvox. 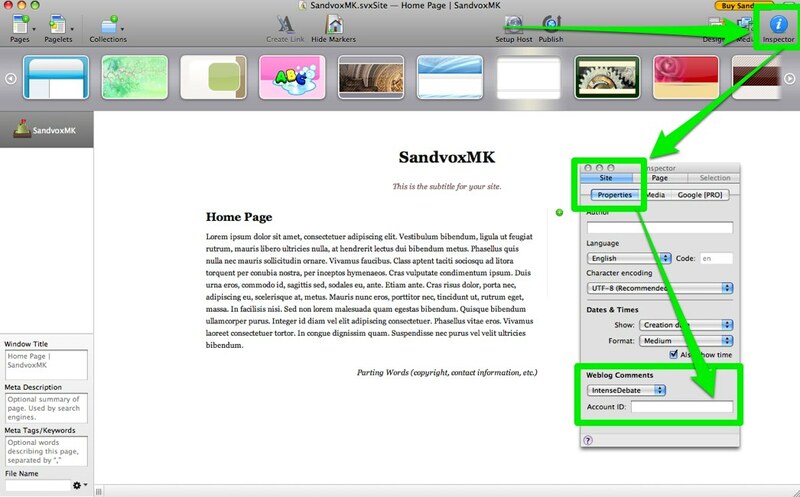 Sandvox is a do-it-yourself website builder for Mac OS X (10.4.11, 10.5, or 10.6). While we highlight some of the key steps for integrating Sandvox in this post, you should check out the complete step-by-step instructions (along with loads of other software tutorials) at Neil’s site, Step How To :: Step-by-Step. Visit http://intensedebate.com/install > enter your URL > and select our Generic Install option. Go to http://intensedebate.com/sitekey select your site from the list > your Site Account ID is located at the bottom. In Sandvox: select Inspector > Site > Properties > and then paste your IntenseDebate Account ID. And you’re all set! Make sure you check out all of your IntenseDebate account settings at http://intensedebate.com/editacct. Many thanks to Neil for his help! CAN you please come with noregian translation to the comment system ??? Why not e-mail IntenseDebate to see if you can help them translate in some way ? Even a few words is better then none. We currently have a couple of volunteers working on translating to Norwegian. Hopefully it's nearing completion! While I don't use Sadvox personally, one of my clients do whom was looking into adding a comment system to his website so I will be sure to pass on this link. The issue should be corrected now. Sorry for the inconvenience. If you're still encountering a problem please email me at support@intensedebate.com.